How a French door refrigerator vs. side-by-side compare? Buyers often get stuck in the refrigerator section when canvassing for one not because they are awed by a specific model or brand, but because they couldn’t, for the life of them, figure out which of these two they ought to buy – A French door fridge or a side-by-side fridge. This is an ongoing battle for refrigerator buyers who are either buying for the first time or are replacing their old one. Which of these refrigerators will give them a bang for their buck? Which of the two do they really need? Both look almost the same, the major noticeable difference being the freezer drawer below in the case of the French door. If you experience this kind of dilemma, this article will help you decide the one that suits your wants and needs by comparing the two. Both have its own pros and cons and in the end, what matters is what you want. 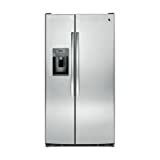 What are the differences of a French door refrigerator and a side-by-side refrigerator? To make it easier for you to decide, you’ll find below the factors that you should consider when getting a refrigerator and how the two types of refrigerators differ on each factor. Style – The French door refrigerator is mostly the model owned by many because it’s the newest style there is in the world of fridges. It is designed to have three doors, side-by-side top with two doors and a bottom freezer section. Some fridges come in four doors, which has double drawers for the freezer. Storage Space – This is the total accumulated space of the fridge, whether separated by counters or not. By knowing this, you’ll be informed about the amount of food you can place in your refrigerator. It is often measured in cubic foot and the average size ranges from 25 cu. ft. up to 30 cu. ft. Big ones go beyond that. The French door refrigerator lets you maximize the space you have. It is wide and can fit pizza boxes as well as large platters and baking trays. Side by side fridges are deemed too narrow to fit all these wide boxes and platters. If you think you’ll have a lot of leftover pizza and can’t be bothered to transfer it to a smaller container, or you often hold parties at home and have a lot of large containers, get the French door. Accessibility – This tackles the ease of getting items in and out of the refrigerator. The French door has more space and is therefore more accessible, especially for larger items. Everything that you need in the fridge, such as food items, veggies, and fruits are at eye level. You don’t need to bend down to access the crisper drawer. Whereas in side-by-side the freezer is on top and everything else is below it. Fruits and veggies are stored down below; so you have to lean down to get them. 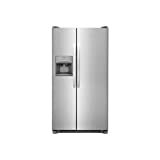 What most people don’t like is the fact that the freezer isn’t something that is accessed a lot in a day while those that should be accessed in a jiffy are located in hard to reach parts of the fridge. Freezer – We’re putting a separate section for the freezer because this is really where the two compete and where the major differences are. For the French door, the freezer is located at the bottom and is separated by a drawer. It is not, in any way, connected to the major body of the fridge. Side-by-side, on the other hand, is accessible inside the main double doors. It is located at eye level. Although the freezer of the side by side is not really accessed a lot all throughout the day, making the other shelves of the fridge difficult to access, it’s really great when you finally have to take out meat and other frozen stuff. This is because it is easier to get stuff when it is at eye-level and you don’t have to dig down the fridge to find something. 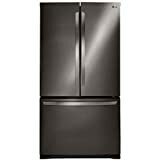 What owners don’t like about the French door refrigerator is the hard to access freezer that are usually not separated by racks. Every time you access it, the tendency is to remove all the stuff in the top first to find the frozen item you need. Afterwards, you’ll have to deal with stacking them inside once more. Key Takeaway: With all the factors considered, it seems that the French door refrigerator wins when it comes to style, storage capacity, and accessibility in the main fridge area. Side-by-side refrigerator wins the storage capacity and accessibility of the freezer. What are the pros and cons of a French door refrigerator? Gives you more storage space, especially for large items. Difficult to find items in the freezer because of digging and disorganization. Kids tend to play with the freezer handle at the bottom. What are the pros and cons of a side-by-side refrigerator? Users will encounter fewer door issues. Fridge and freezer are easy to organize. Doors that come with through-the-door ice and water dispenser take up a bit of freezer space. Does not have enough space in the main fridge area for pizza boxes, big platters, etc. You have to bend down to access the crisper drawer and lower shelves. Your needs and wants shouldn’t be dictated by the experiences of other people about their chosen refrigerator type. It’s up to you whether to pick French door or side-by-side depending also on your budget, preference, and available space.